How much have teachers and their pupils benefitted from the top-down Westminster-led control of policy held in place by a powerful national inspection regime? 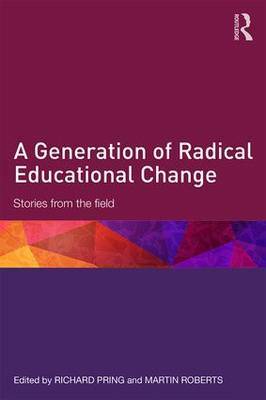 A Generation of Radical Educational Change: Stories from the Field is an exploration of the revolutionary impact of the greater and continuing involvement of central government in education policy-making which began in 1976 and was accelerated by the 1988 Education Act and subsequent legislation. In the book, a dozen distinguished contributors from a wide range of sectors explain and reflect on how they worked to do their best for their schools, teachers and pupils in these years of great change. They understand the reasons, explained by Lord Baker in his early chapter, for a National Curriculum in 1988, and also the reasons for a more effective national inspection system. Yet their stories accumulate to become a powerful critique of the top-down policies of the last two decades. These policies have been too numerous, short-term, incoherent and partisan; governments have been indifferent to professional opinion and serious research, and have relied excessively on measurable outcomes and simplistic Ofsted judgments. Our current system is narrower and less democratic than it was, but evidence is hard to find that English pupils are doing any better in international comparisons. The combined reflections in this volume are timely in these years of lively educational debate as are the suggestions for future policy. A Generation of Radical Educational Change is an invaluable read for current and aspiring headteachers, policy makers and those with an interest in education policy and how it evolves.